Hello Fall! Don’t get me wrong, I have been LOVING the past week or so of unseasonably warm temperatures, however there is just something wonderful about autumn that gets me excited. I think it is the combination of cozy sweaters, warm foods and pretty leaves that get the ball rolling. Butternut squash is one of my favourite fall foods. It is a great source of fibre, B6 and folate. This recipe for soup is a hit every time! I recently made this with a group of seniors at a workshop. It got rave reviews! I love the creaminess of the coconut milk and the burst of lime. How do you like to eat squash? Leave your comments below! There is nothing like a warm soup to warm the soul on a cool fall day. Butternut squash is full of healthy goodness to! It is a great source of fibre, vitamin B6 and folate. The coconut milk makes the soup rich and creamy and the burst of lime juice gives a little extra hit of flavour! Wash and cut butternut squash in half. Place into a cookie sheet, flesh side down into 1/2 inch water. Bake in oven for about 30 – 45 minutes until flesh has softened. Baking time will depend on how big the squash is. 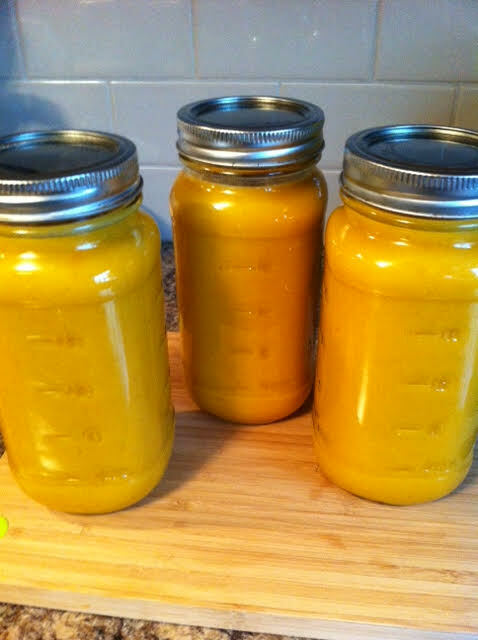 Allow squash to cool so that you can handle it comfortably and scoop out the insides. Meanwhile, sauté onion in coconut oil or butter. Once onion is softened, add ginger & garlic and sauté for another 1 -2 minutes. Add in squash and broth, coconut milk and sea salt. Simmer for about 20 minutes. Squeeze the lime into the soup just before blending. Voila! You have a tasty soup that will warm you on a chilly warm day!